Caring for a tile floor may be different from other flooring surfaces. Today’s tile usually has a very delicate finish, which can be scratched by harsh bristled brushes, scouring pads or steel wool and caustic, abrasive chemical agents. 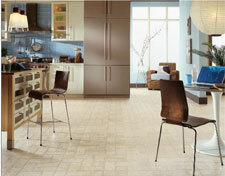 Another question you may have is about the grout finishes on tile floors. How do you get stains out of grout? While most tiles are treated at the manufacturer level, each tile has its own resiliency to staining. The grout may be porous and slightly more susceptible to staining, but there are very successful procedures you may use which can make your floor almost totally stain proof. 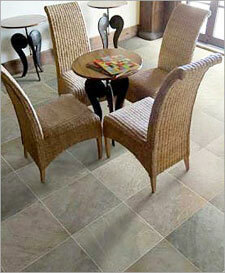 Floor tiles come from the factory, with a variety of treatments already in place. In their initial stage as molten clay, aluminum powder may have been added to strengthen the tiles. Some may have been treated with a glaze to add a layer of protection and enhance their appearance. All tiles are then fired to immensely high temperatures, essentially cooking the tile, and further sealing the glaze. Finally, your tile is treated to a sealer which will protect it, both in transit to your home and then again once it’s set in place in your home. 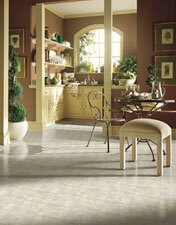 Factory procedures are in place to insure that your tile floor is beautiful for the life of the floor with proper care. Don’t forget that once laid, now it’s your turn to continue that maintenance, and prolong the life your floor indefinitely. Keith Clay Floors recommends a solution of mild soap and warm water applied the surface of the tile on a regular basis is generally. Regular mopping will usually be enough to keep your floor clean and looking its best. But from time to time, depending on the level of household traffic, it may be necessary to spruce your floor up with a few readily available treatments we have listed below. If you are unsure about what type of tile, sealers, or stains you have, simply call us and one of our qualified staff will come out and evaluate the floor to make recommendations. How do you remove stains from tile? You may have stains on the tile floor from kitchen mishaps. Some stains could soak themselves into the porous finish of some manufactured tile. Bleach can be used in most cases to remove some of the nastier, deeper stains, but where bleach does not reach, what can you do? There are so many household tile cleaners that make inflated claims about removing deeply saturated stains or hard water marks from tile. Serious stains nearly always require a professional application method of diluted muriatic acid. Muriatic acid has been carefully used by trade professionals for decades to treat and remove industrial stains from tile and stone surfaces. Keith Clay Floors understands it is important to thoroughly ventilate the area and protect extensively from this corrosive agent. All our staff use heavy gloves, masks and eye protection, which we believe to be imperative for safety, and quickly wash the area down, discarding the remaining mixture in a safe and proper manner. Keith clay Floors will refer to your local regulatory agency regarding regulations for disposal of acid products. What About Cleaning the Grout? If a stubborn stain emerges in your grout, give us a call at 972-463-6604. We will follow the same steps described in the procedure above to gently work the stain out. If a situation happens in which the stain cannot be removed, it could be necessary to replace that particular area of grout. Grout can be removed quickly and effectively by using a grout remover. We can then work the stained section of grout until clean grout is present. The indentation in the grout that needs to be filled is matched to the existing grout and filled to match the other tiles. Visually, the result is a very close match to the original grout. Should You Use A Tile Sealer? Keith Clay Floors is happy to come out and evaluate your tile and make a professional recommendation as to how to proceed. There are several good quality tile sealers available. These are great tools to keeping your tile and grout looking fantastic, and with installation intervals of four years and beyond. Once applied, the stain resistance of your floor is dramatically increased, and the overall finish is kept to a factory high standard. Depending on the products used, we may suggest a general buffing of the area for maximum beauty and shine. Tile provides a resilient, durable surface that, if treated properly, can bring a great element of design to the decor in you home or business. For questions on products, be sure to give us an opportunity to evaluate the condition of the area in question. Give us a call at 972-463-6604, we can set an appointment at your convenience.